LOOKING for that light meal with a difference summer. Well this one is perfect. 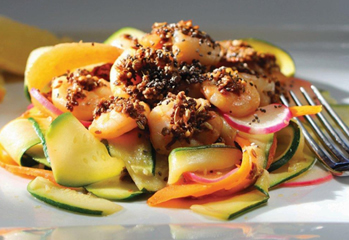 A great light easy energizing meal that can be shared with friends and family, with its vegetable pasta combination and easy marinated prawns. Heat pan on medium heat and add cumin, fennel, and coriander, and mustard seeds and stirring constantly for a few minutes until you can smell the aroma of the spices. Then place them into a mortar or spice grinder and grind to fine powder. Then place powder into a glass bowl with crushed garlic, 2 teaspoons of sesame seed oil and mix well. Coat the prawns well and place in the fridge for 15 minutes to marinate. Take the zucchinis, carrot and using a vegetable peeler cut into long thin ribbons and set aside in a bowl. Slice the radishes very finely and add to a bowl with pepper, salt, juice of one lemon and toss vegetables gently. Next heat pan on low to medium heat add 1 teaspoon of sesame seed oil and cook prawns for a couple of minutes until they go pink. Then add vegetable pasta to the pan for 2 minutes and toss with a little oil and lemon juice then plate up and sprinkle chai seeds on top and serve. Serve extra lemon wedges on the side.